En juste un jour, nous parcourons la vie de trois personnages dans l’Ouganda contemporain. iMANi est un regard nouveau sur l’Ouganda post Idi Amin, post LRA (« Lords Resistance Army », les seigneurs de l’Armée de la Résistance). Pour son premier long métrage, nouveau talent de l’ouganda, Caroline Kamya, nous offre un portrait intime de la vie d’un enfant soldat, d’une femme de ménage et d’un danseur de hip hop dans l’Ouganda d’aujourd’hui. Imani means « faith » in Swahili, a quality required to overcome the challenges of life. Set in the course of just one day, this award-winning film ventures into the lives of three characters within the diverse landscape of contemporary Uganda. « Olweny » is a deep thinking, intense 12 year old former child soldier. A new chapter in his live begins as he starts his journey to his rural home after a few weeks of post-war rehabilitation. Is he ready to return to his family who have not seen him for over 4 years or are demons of his past going to resurface once again? « Mary » is a strong and determined 25 year old maid who returns from her village to a wealthy suburb in the capital Kampala where she works. Family responsibilities create havoc in her daily routine forcing her to make some tough decisions that will forever affect her life. « Armstrong » is fun loving and talented 18 year old break dancer with a turbulent background. He makes plans to return to the inner city « hood » to stage a free dance performance but skeletons from his past, surface and force him to face what he thought he had left behind. « iMANi » is the debut feature film by award winning director Caroline Kamya and written by her sister, social anthropologist, Dr Agnes Kamya. « The Kamya Sisters » are the ambitious filmmaking sister act behind IMANI. This is an exciting time for African Cinema. In East Africa specifically, cinema is now going through a renaissance with a small group of strong female directors emerging on the world stage. Their films are different from the francophone art house or the West African melodramas of « Nollywood ». A new wave has come about and IMANI is a product from the « East African New Wave ». lMANI which means « faith » is so called because all title characters survive and rely on faith. 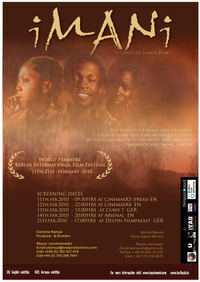 The film is also a testament to the belief I have in our creativity as Ugandans. We can tell our own stories in a powerful and unique way, in our own voices. IMANI is the first feature to be filmed on a RED Camera in Uganda and also in the local languages of Luganda, and Acholi with a cast and crew of mainly inexperienced locals. In addition, for the first time the area of Gulu is captured on film by a local fiction filmmaker highlighting life after the conflict of recent years. Imani tarkoittaa swahiliksi »uskoa, luottamusta » – ja sitä elokuvan päähenkilöt tarvitsevatkin selvitäkseen ugandalaisen arjen tuomista haasteista. Palkitun elokuvan vahva näyttelijätyö, autenttiset miljööt ja erinomainen musiikki vievät katsojan pintaa syvemmälle ugandalaiseen elämänmenoon. Un día cualquiera en Kampala, la capital de Uganda y en la provincia de Gulu. Mary, que trabaja en la casa de una mujer de la alta sociedad, deberá encontrar el dinero necesario para comprar a la policía y liberar a su hermana de la cárcel. Olweny es un ex niño soldado de 12 años que deja el centro de rehabilitación para volver al pueblo de sus padres, destruido por la guerra. Armstrong, un bailarín de breakdance, debe montar un espectáculo para esa misma noche.